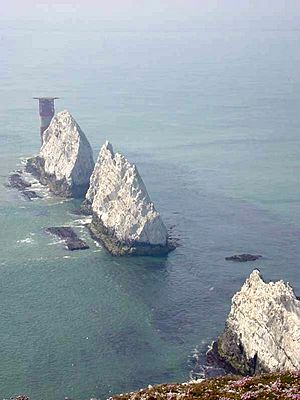 Ninety million years ago the chalk downland of Northern Europe was ooze at the bottom of a great sea. Protozoans such as foraminifera lived on the marine debris that showered down from the upper layers of the ocean. Their bodies were made of chalk extracted from the rich sea-water. As they died, so a deep layer built up, and slowly it became consolidated into rock. At a later date the sea-bed became dry land, as earth movements thrust it upward. Chalk is composed mostly of calcium carbonate with minor amounts of silt and clay. It is normally formed underwater, commonly on the sea bed, then consolidated and compressed during diagenesis into the form commonly seen today. During diagenesis silica accumulates to form chert or flint nodules within the carbonate rock. Chalk has long been quarried in England, providing building material and marl for fields. It is also used to make quicklime and slaked lime, mainly used as lime mortar in buildings. 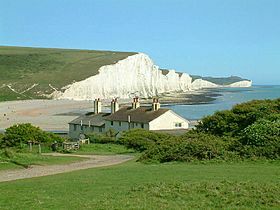 In southeast England, Deneholes are a notable example of ancient chalk pits. Such bell pits may also mark the sites of ancient flint mines, where the prime object was to remove flint nodules for stone tool manufacture. The surface remains at Cissbury are one such example, but perhaps the most famous is the extensive complex at Grimes Graves in Norfolk. The traditional uses of chalk have in some cases been replaced by other substances, although the word "chalk" is often still applied to the replacements. Sidewalk chalk is similar to blackboard chalk, except that it is formed into larger sticks and often colored. It is used to draw on sidewalks, streets, and driveways, mostly by children, but also by adult artists. Polishing chalk is chalk prepared with a carefully controlled grain size, for very fine polishing of metals. Chalk is a source of quicklime by thermal decomposition, or slaked lime following quenching with water. Woodworking joints may be fitted by chalking one of the mating surfaces. A trial fit will leave a chalk mark on the high spots of the corresponding surface. Chalk transferring to cover the complete surface indicates a good fit. Chalk Facts for Kids. Kiddle Encyclopedia.